After losing out on a 2013 Oscar nomination in the Best Director category, Ben Affleck and his film Argo became the season’s biggest talking point. After losing out on a 2013 Oscar nomination in the Best Director category, Kathryn Bigelow and her film Zero Dark Thirty faded out of the picture. Already battling wishy-washy political arguments that threatened to shift the spotlight away from the film, Bigelow’s docudrama thriller was all but knocked out of Oscar consideration when the critically acclaimed director failed to sit alongside 2012’s contenders. The snub was a reminder of a sad fact that remains a talking point each year: In the 85-year history of the Academy Awards, only four women have been nominated for the “Best Director” Oscar. And only of them won: Bigelow, for 2009’s The Hurt Locker. There’s an imbalance of female and male directors represented in the Hollywood mainstream. It’s a point argued year after year, yet it’s a statistic that never seems to change. According to a study by Dr. Martha M. Lauzen, Executive Director, Center for the Study of Women in Television and Film, School of Theatre, Television and Film, 18 percent of all directors, executive producers, producers, writers, cinematographers, and editors working on the top 250 domestic grossing films of 2012 were women. And only 9 percent of all directors working on those films were women. 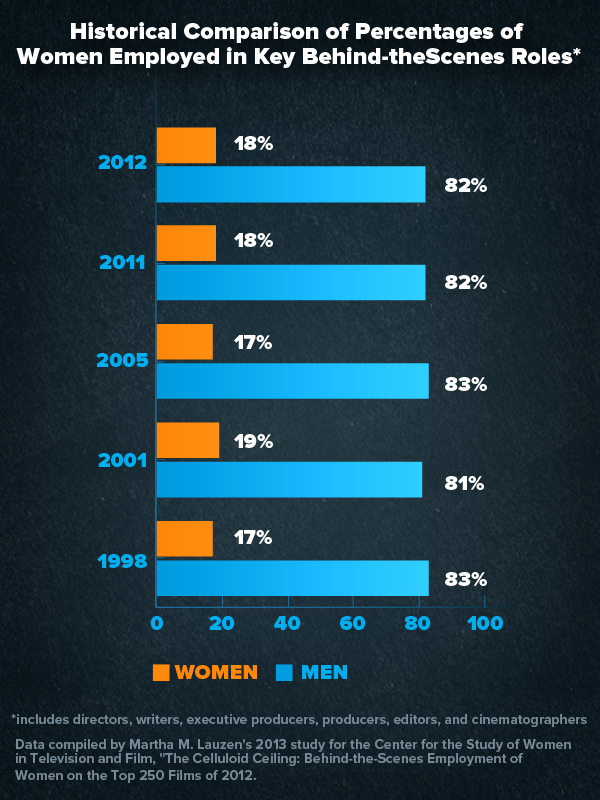 While that’s a 4 percent bump up from 2011, the percentage of women directors working in 2012 was the same as in 1998. In 2013, three women are slated to direct studio-driven, wide-released feature films: Tyler Perry Presents Peeples (May 10), directed by Tina Gordon Chism, Carrie (Oct. 18), directed by Kimberly Peirce, and Disney’s animated feature Frozen (Nov. 27), co-directed by Jennifer Lee alongside Chris Buck. A few more will sprout from between the blockbusters into limited releases: Sally Potter’s Ginger & Rosa (March 15), Sofia Copolla’s Bling Ring (June 14), Mira Nair’s The Reluctant Fundamentalist (April 26), Maggie Carey’s The To Do List (Aug. 16), Kelly Reichardt’s Night Moves (Sept. 20), Susanne Bier’s Serena (Sept. 27), Diablo Cody’s Paradise, and the Soska sisters’ American Mary. Women are making movies, but considering the sheer number of films in theaters from year to year, they’re not making enough movies — and they’re rarely making them with the support of Hollywood. With Peeples — which stars Craig Robinson and Kerry Washington — ready for release, Chism already has a follow-up in place, a thriller set up at Sony. Despite having a feature under her belt, Chism says the process was the same: more teeth-pulling, more clinging to her script, more proving herself capable. “I’m not sure if I’ll have to do that forever,” Chism says. “I think it has to do with power, basically, and in this industry, the writer doesn’t hold the largest bit of power. So it’s more palatable for people to deal with women as writers.” Hollywood does appear to be more receptive to hiring females in that role; Lauzen’s study reveals that women account for 15 percent of the writers working on the top 250 films of 2012. Like Chism, Jennifer Lee also comes from a writing background. Before being recruited by Disney Animation head honcho John Lasseter to co-direct Frozen, Lee had sold two screenplays: an adaptation of John Steinbeck’s The Acts of King Arthur and His Noble Knights and an original script being developed at Leonardo DiCaprio’s Appian Way production company. She was brought into the Disney fold by her Phil Johnston, a friend from Columbia University’s film school who recruited her to write on Wreck-It Ralph. After meeting weekly for years in order to “push each other as writers,” Johnston asked Lee if she would be willing to move to Los Angeles on a week’s notice to take over Wreck-It‘s script, which he had initially developed years before. 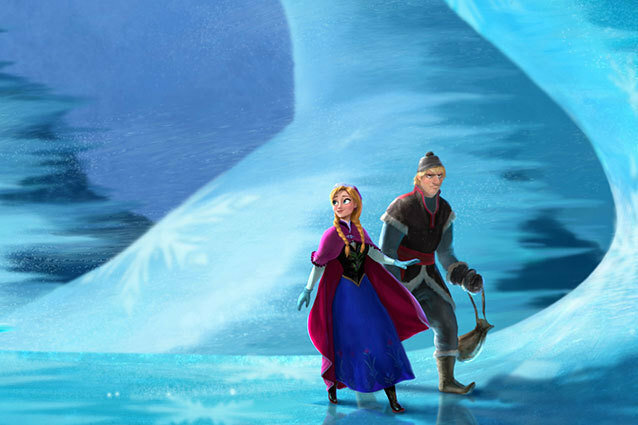 The success of the 2012 Oscar nominee — and the nurturing environment of a long-gestating animated film — landed her the job co-directing Frozen. Unlike live-action’s homogeneous roster of filmmakers, animation has traditionally welcomed female directors. In 2012, Brenda Chapman became the first woman to receive an Oscar for Best Animated Feature for Brave (sharing it with Mark Andrews, who took over as director halfway through production). Vicky Jenson (Shark Tale) nearly took home the award in 2001 for co-directing Shrek — in the category’s first year, only the producers were awarded with the gold statue. In the grand scheme of Hollywood, Jennifer Yuh Nelson possessed the most important honor: Her Dreamworks Animation film, Kung Fu Panda 2, is the highest-grossing female-helmed movie of all time, with a whopping worldwide gross of $665.7 million. In terms of creativity, box office numbers are inconsequential. But in Hollywood, they’re a calling card and a record-setting number like Nelson’s Kung Fu Panda 2 gross goes a long way. Which explains why women filmmakers are climbing uphill to get projects with larger budgets off the ground. Running down the list of the highest-grossing directors of all time (based on BoxOfficeMojo.com’s director filmography totals), we don’t find a woman until No. 60: Lana Wachowski, director of The Matrix trilogy, who first entered the industry as a man. Further down at No. 81 is Betty Thomas, one of the few women to have shaped a career out of directing modest blockbusters. Including The Brady Bunch Movie, Doctor Dolittle, 28 Days, and the recent Alvin and the Chipmunks: The Squeakquel, Thomas’ films have collected nearly $563.3 million. For women to stake a claim in box office history, they must be given the opportunity to direct blockbusters, the type of genre filmmaking narrowly aimed at adolescent boys. A 2011 study released by the Motion Picture Association of America cites that the gender composition of moviegoers was balanced, about 51 percent women, 49 percent men, with the 25 – 39 age demographic representing the largest portion of the audience, around 28 percent. Yet most of the major studio tentpoles are male-driven. Out of 45 movies based on comic books released between 2003 and 2013, only one of them was directed by a woman: Lexi Alexander’s 2008 film Punisher: War Zone. The lack of women represented in genre movies makes Kimberly Peirce’s horror remake Carrie an event in itself. 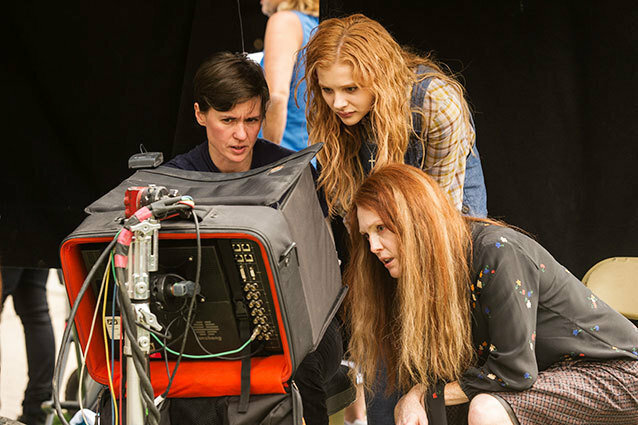 Like many female directors actively working in the film industry, Peirce is hesitant to make gender divide a talking point when discussing her new adaptation of the Stephen King classic. The Boys Don’t Cry and Stop-Loss director wants to be seen as simply that — a director. Still, she believes women do add perspective to genre stories, and in the case of Carrie, perspectives that echo themes laid down by the book’s author. The latest from Jane Campion — another of the female quartet to have been nominated for the Best Director Oscar — is a prime example of Hurd’s observation. Sundance Channel’s upcoming series Top of the Lake, a deeply cinematic crime procedural, was written and directed by Campion. The series premiered in full at this year’s Sundance — the first TV series to do so at the festival. Along with Campion’s ambitious project, the festival also played host to a number of female-directed indies, including Lynn Shelton’s Touchy Feely, Lake Bell’s In a World…, Jerusha Hess’ Austenland, and Stacie Passon’s Concussion. Thanks to a frenzy of distribution company purchasing, most are expected to arrive in theaters this year.